From January 1st 1995 until the end of 2015 I wrote approximately 60 Prophecies as SOLLOG. These Prophecies all had direct literal hits or used simple codes to show I KNOW THE FUTURE. Yesterday, near Paducah Kentucky another school shooting struck this tiny population zone. That event was 20 years and 1 month and 23 days from the first shooting in a school in that area. Since 1995 most of my Prophecies connected to the PENTAGRAM OF BLOOD. 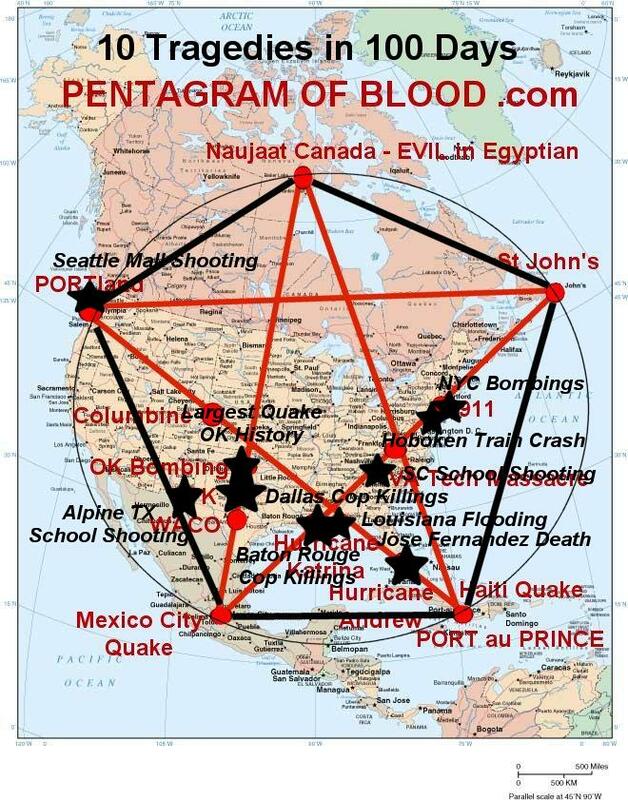 The PENTAGRAM is 5 lines that form a huge blood sacrifice Pentagram over North America. These two school shootings in Kentucky are anomalies, they do not fall on any of the 5 lines while the rest of the events do. So the message from these two tragic shootings in Kentucky is simple, the time between the shootings contains the date of the Asteroid event I have warned of since 1995. I said for over 22 years the asteroid impact that kills off 99.9% of humanity will strike shortly after 2022. The date is January 20th 2023. Only 6 million or so humans will survive this historic event all in SAFE ZONES. The SAFE ZONES are three high mountain regions in remote Canada, North China and South America. You have all been judged. The chosen 6 million will relocate and the rest of humanity will be terminated over the days, weeks and months after the asteroid impact occurs. The souls or energy of these humans that die from the asteroid impact will be processed to feed the great abyss, the dark regions of the Universe with no energy or light. Human souls are like a crop of grapes the juice of the crop is the human soul or energy and it will be harvested and collected by the 9th Level to fuel the growth of the 3rd level illusion in which humanity lives. The 9th Level on May 1st 2017 erased the word Messiah from hundreds of Bible’s and Tanakh’s as well as Qu’rans all over the world to show this event is nigh. There is NO MESSIAH and THERE WAS NO JESUS. The letter J didn’t exist until around 400 years ago in any alphabets, the story of Jesus and that name is entirely made up. So let the crop of ignorant energy believe in that lie and let them all die where they now live. 24th Day of January in the year 2018 C.E.